A recent paper shows the RNAi complex Ago2/RISC localized to cytoplasmic bodies. 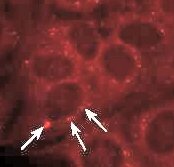 Indirect IF of human epithelial cells stained with ab15843 and a secondary rhodamine conjugated antibody identified by the white arrows. Our GW182 antibody [4B6] (ab15843) has been used in a recent paper that identifies cytoplasmic bodies as the location of Argonaute 2 (Ago2) in mammalian cells. Argonaut 1 was also concentrated in these sites, known to be centers for mRNA decay. These findings provide new insights into the mechanism of RNAi. Sen GL & Blau HM. Argonaute 2/RISC resides in sites of mammalian mRNA decay known as cytoplasmic bodies. Nat Cell Biol 7:633-6 (2005). Ago2 is part of the RISC protein complex. This complex is involved in the RNAi process, inhibiting the expression of targeted genes. The complex recognises small interfering RNAs (siRNAs), unwinds them from their double-stranded state and allows cleavage of their target mRNAs. Ago2 is the endonuclease that carries out this cleavage. Cytoplasmic bodies (human cells) or processing bodies (yeast) are known to be centers of mRNA degredation. They contain exonuclease and decapping enzymes known to be involved in mRNA degredation. Knock-out studies have shown that unstable mRNAs are targeted to these bodies. Although there is no direct evidence that the entire RISC complex is located in these cytoplasmic bodies, there is evidence of links between RNAi and mRNA degredation in Aribidopsis thaliana and Drosophila melanogaster, where cytoplasmic body exonucleases are required to degrade the cleavage products of RNAi. Formalin-fixed parafin embedded colon was incubated with ab6284 at range of dilutions (1/100 - 1/3000). Excellent staining of the colonic epithelium was seen using 1/1000 dilution. Heat-induced epitope retrieval was used. Sen et al used an eGFP-tagged form of Ago2 to study its cellular localization. Using various subcellular markers (including Abcam's mouse ant-58K Golgi apparatus protein antibody (ab6284)) they showed that it did not colocalize with the the ER or Golgi, but was clearly concentrated in discreet cytoplasmic foci. 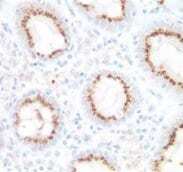 Using the GW182 antibody [4B6] (ab15843) they showed that these foci were indeed the cytoplasmic bodies. GW182 is an autoimmune antigen that is located in cytoplasmic bodies and thought to be involved in mRNA metabolism. The protein is made up of multiple signature glycine / tryptophan repeats, and houses an RNA binding domain at the C terminus. To confirm this, the Ago2 was also shown to colocalize with the decapping enzymes Dcp1a and Dcp2, both specific to cytoplasmic bodies. By introducing siRNAs that would not usually be present in endogenous cells, it was shown that this localization was independent of the presence of siRNAs. However, RNaseA treatment to remove all RNA caused a decrease in the localization. This suggests that the cytoplasmic bodies may be ribonucleoprotein complexes involved in mRNA processing and degredation. This colocalization of key components of the RNAi process and mRNA degredation machinery suggests a mechanism where the mRNA cleavage products from RNAi can be rapidly processed and removed. However, many questions still remain. It is not yet evident whether Ago2/RISC is permanently in the cytoplasmic bodies or whether a shuttle mechanism is in place. The mRNAs for degredation must somehow be transported from the cytoplsm to the cytoplasmic bodies, whether this be through a shuttle mechanism involving Ago2/RISC or through some other method if Ago2 is permanently in the cytoplasmic bodies. Another question arising from these studies is the roles of the different Argonaute proteins and whether they show specificity for different mRNAs. Argonaute 1 (Ago1), also capable of binding siRNA and mRNA molecules, was found to colocalize with Ago2 in the cytoplasmic bodies. Previous immunoprecipitation studies have suggested that the two proteins bind the same micro RNAs (miRNAs). These results could be due to the whole cytoplasmic body complex of Argonaute proteins and their miRNAs being precipitated, rather than the separate proteins and their targets. Further studies are needed to clarify this.